Oiltec. Oil Boiler Servicing, Aga & Rayburn Specialists. Welcome to Oiltec - your first call for oil boiler servicing, repairs and installations. We are independent service engineers who specialise in Oil boiler, Aga Cooker and Rayburn service, repair, breakdown and commissioning. We provide oil heating and cooking service, repairs and maintenance. Swimming pool boiler service breakdown and repair. The areas we cover Hampshire, Wiltshire and Dorset for Domestic, Commercial and Industrial Oil Boiler appliances, we are also independent service engineer specialists for Aga cooker service and Aga cooker servicing. We attended Worchester Bosch, Grant UK, and Aga/Rayburn training workshops to keep up to date with new appliances. Learn about our Oil Tanks Servicing. Learn about our Aga & Rayburn Servicing. 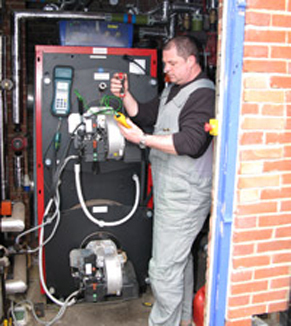 Learn about our Oil Boiler Servicing. Our service vans are extremely well stocked for all emergency oil boiler, burner breakdown & servicing. We would like to thank you for changing the oil pump on our newish boiler and at such short notice, the warranty engineer from Worcester Bosch came on the Wednesday, we are writing to the head office as we discuss, please find the enclosed cheque. Many thanks for coming out at such short notice to have another look at our Grant oil boiler. I have been very impressed with your service and your willingness to look that bit further into a problem than most of your contemporise do. I really do appreciate your ability to find a solution to a problem even when strictly it falls outside your area. I enclose payment for your most recent visit. With many thanks.